I was driving in normal chicago traffic yesterday when some moron in a cargo van hit me going about 30. Not sure if this is repairable or what the cost would be. I've looked at some other posts but still not confident on what to expect. Any thoughts? Outside of the rear quarter panel, looks to be little intrusion which is good. Should all be repairable. Just work closely with your insurance company so you're properly taken care of and satisfied with the results. I assume you're okay? I usually avoid these threads because they are pointless... during the licensing process I assume we were all taught what to do when we get into an accident. File a claim with the insurance and take it from there. I don't see how asking a forum will help the situation any. I'm fine just a little sore, my seat 'collapsed' when I was hit, it sort of re-positioned/extended fully, back and headrest. I'm guessing that was supposed to happen? Also, just went down to take a look at it again, passenger side rear seat seems stuck and won't fold down. Frame damage? He didn't ask what to do...he is wondering what people think the final outcome will be. First, glad your okay. 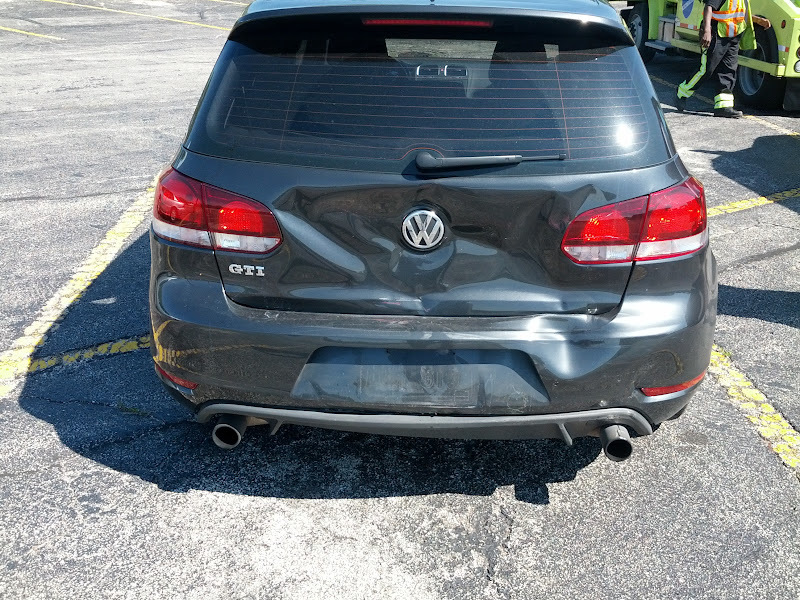 Getting rear ended can never be good. Are those stock exhaust tips? Looks like they're exposed alot more than they should be. Is the whole rear end pushed in a couple inches? 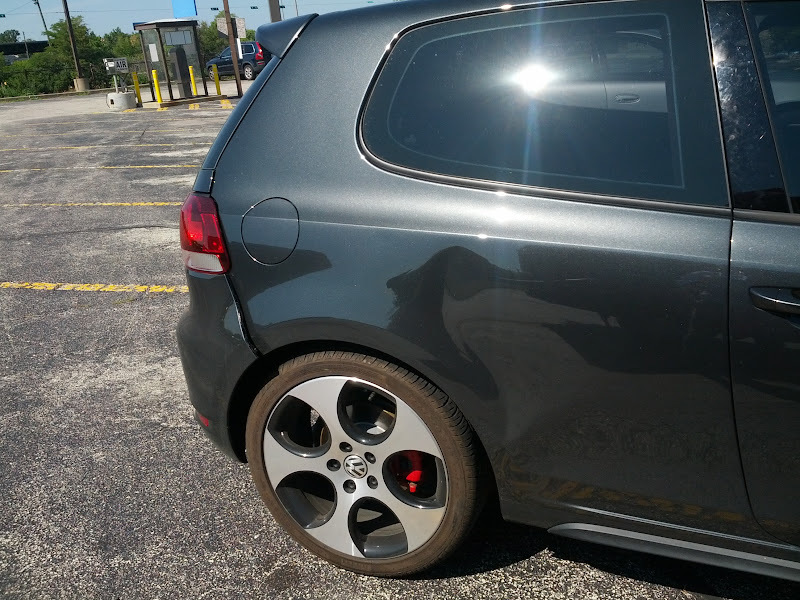 Carbon steel gray metallic 2011 GTI 4-door w/ sunroof. 6 speed DSG A/T - ECS Turbo Outlet w/ Muffler Delete - VMR V701's Hyper Silver - Floor mat kit - Clear side markers - LED lighting - Under seat stowage bin - unSoundaktored - DEI Soft Chirp Horn - deAutoKey LED turn signals. You're looking at more than 5k in damages, probably by a long shot. Other driver's insurance should cover it. It doesn't seem like there would be frame damage because he hit you so high. Someday I'm gonna run a set of Rotas. Sorry to hear about the accident. Glad you're okay though. Which insurance company do you have? Tapped from my Galaxy Nexus. Glad you were okay after. How long did it take to get it to the shop? Did ya know this is 2 year old thread? Hey, I was just asking a question! Send a private message to spagett! Find More Posts by spagett!